"Tastes rich and crunchy, yet it's very quick and simple to prepare. Lovely with a nice glass of wine. Sometimes I make this for myself to eat with a salad." Pour chopped nuts into a bowl, and set aside. 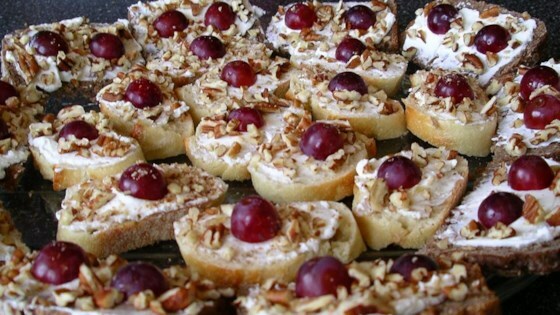 Spread each bread slice with approximately 1 tablespoon goat cheese. Dip into the pecans to thoroughly coat the cheese. Arrange on a plate, and push a grape half into the top of the cheese on each slice. Prepare shortly before serving, or slide plate into a resealable plastic bag to keep bread slices fresh. I used the main idea but using what I had on hand, substituted crackers for bread, cream cheese for goat cheese and almonds for pecans. Still great. This recipe was a hit at a cocktail party. I used goat cheese flavored with basil and roasted garlic and toasted the baguette before spreading the cheese. Will definitely use this recipe again. I absolutely loved these! i added some italian seasonings to the goat cheese mixture, and preferred the grapes cut into fourths. soo delicious! Delicous! I made this per the recipe, and I loved them. I did make another trip to the refrigerator for more grapes, but I thought this combination was wonderful! Thank you, Virginia! These are delicious and so easy to make. I thought the grapes might be for decoration, but they made these fantastic. Oh, and the other party goers loved them too.